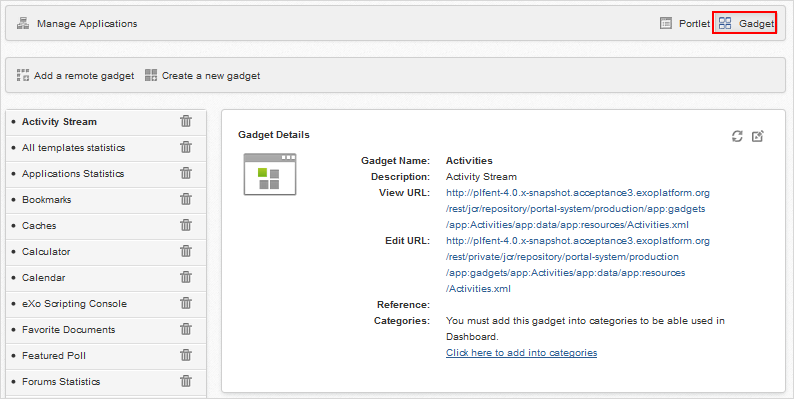 To add a gadget, you first need to access the Gadget page by selecting Gadget on the Tab bar of the Manage Applications page. You can add a remote gadget using its URL or create a new gadget into the list. Click the Add a remote gadget link. Enter the link of your desired gadget which is in the .xml format in the URL field. Click Add to accept your inputted URL. The selected gadget will be added to the gadgets list in the left panel with its details in the right panel. Click the Create a new gadget link. Enter values in the form. Click Save to accept creating your new gadget. To add the newly added remote gadget to a specific category, simply click the "Click here to add into categories" link at the bottom of the right panel. The table listing all categories will appear and allow you to select your desired category. To update information of the added gadget, simply click to refresh information. You can delete a local gadget using corresponding to each gadget in the left gadgets list. See the Adding more external gadgets from Dashboard section for instructions on how to add new gadgets from the dashboard.